We live in an increasingly "virtual" world in which it can be tempting to skip making that true, human connection with someone in pain. Even though our thoughts might be with them, we lack the confidence to reach out, worrying that we will say or do the "wrong" thing. In this practical, step-by-step guide to what she calls "the art of comforting," Val Walker draws on numerous interviews with "Master Comforters" to guide readers in gently and gracefully breaking through the walls that those who are suffering often erect around themselves. Interviewees include inspiring individuals such as Alicia Rasin, who, as a victim's advocate for the city of Richmond, Virginia, has devoted her life to comforting grieving families devastated by homicide, gang violence, and other traumatic experiences; or Patricia Ellen, who, as a grief counselor and outreach director at the Center for Grieving Children in Portland, Maine, appears on site to support and comfort children, staff, and parents when a school is facing a death, violence, or other crises. Val Walker received her MS in rehabilitation counseling from Virginia Commonwealth University and is a rehabilitation and bereavement consultant. Her work has appeared in AARP Bulletin, Time, Good Housekeeping, Coping with Cancer, and Whole Living. 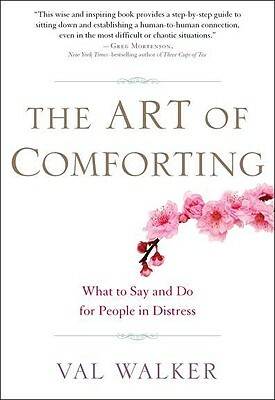 Walker is the author of The Art of Comforting: What to Say and Do for People in Distress, which won the Nautilus Book Award. "In The Art of Comforting, Val Walker points to a great irony in our society today: as hyper-'connected' as we are, deep down, many of us fear that we lack the ability to effectively comfort another human being. This wise and inspiring book provides a step-by-step guide to sitting down and establishing a human-to-human connection, even in the most difficult or chaotic situations." "The Art of Comforting is must reading for everyone...The message is instantly applicable as well as enormously comforting." "With clarity, compassion and wisdom, Walker teaches the art and the craft of comforting others and ourselves. In today's distressed and frenetic world, she does us all a great favor. This fine book is a resource for all those who want to be able to help friends, family members and other people who are in need of our kindness." "In an effort to write the book she couldn't herself find, rehabilitation counselor Walker discusses the nature of comforting and illustrates how to restore this most important skill. Her message comes not only from experience, but from others in the grief/trauma counseling field, in this guidebook that rings true and pulls the reader in for more. Recommended for all interested adults."